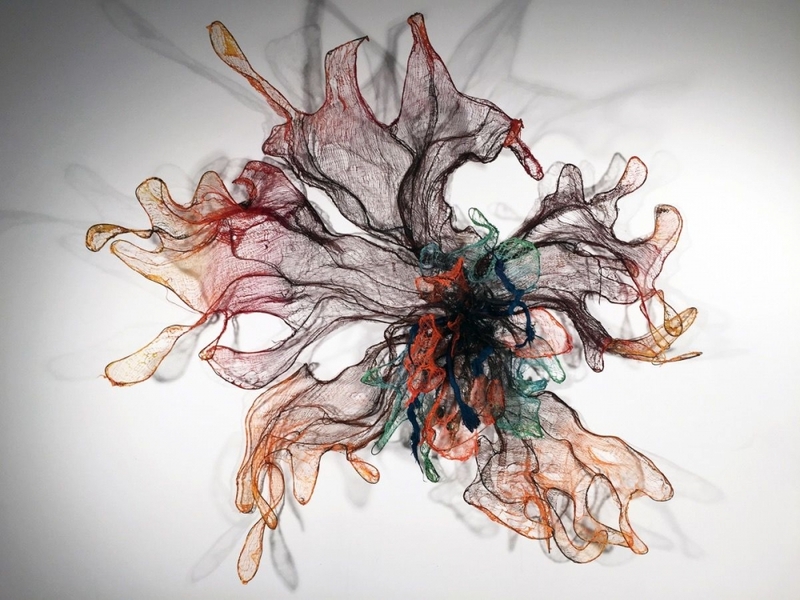 For Nnenna Okore, working in three dimensions is liberating, allowing her to immerse herself “in the well of sensory experiences,” she said. Okore engages in a “slow, arduous” process of weaving, dyeing, winding, and teasing materials like burlap, wire, and paper—sometimes sourced from West Africa—to create dramatic textile installations that resemble the undulating fabric forms of artist El Anatsui, who was once Okore’s teacher. Her sculptures often reflect on the wildlife and craft culture she encountered in Nigeria, where she grew up observing the natural world and watching people engaged in repetitive manual labor, like making brooms by hand. Down to Earth (2017) suggests a vivid red whirlpool giving way to a waterfall, or even the breakdown of (human) organic matter, while Fringes and Fragments (2017) evokes a school of ominous black jellyfish. Okore, who will show her work in a group show with Jenkins Johnson Gallery at this year’s EXPO Chicago, has, in the past, combined her sculptures with audio and video elements to create multimedia explorations of her childhood memories.